As a little girl growing up in Harlem in the 1950s, peddlers in horse-drawn wagons were always a happy sighting. 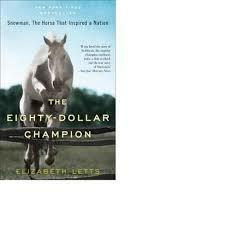 Elizabeth Letts’ book, “The Eighty-Dollar Champion: Snowman, The Horse that Inspired a Nation,” took me back to those days, when horses were still part of both rural, and urban life. The setting for Letts’ feel-good horse story is Long Island, NY, right after WWII. The main character, Harry de Leyer, a Dutch immigrant and Snowman’s owner, reminded me of another hardworking European immigrant. His name was Abe, and from his wagon, he sold vegetables on our street, and treated his gentle horse like a prince. In the late 1950s, it wasn’t uncommon for men like Abe and Harry de Leyer to make a living, and a new life, in their new country, with the help of a horse. The actual circus, like the Horse Show, performed upstairs in the arena, but a circus fan’s first stop was always in the cramped basement to see the sideshow. And, just as the Horse Show’s expensive thoroughbreds and jumpers lived in the basement, the circus animals also boarded down there. Each year I’d see the elephants changed by their ankles, lethargic bears, and riled up lions and tigers nervously pacing in small cages. America was not always a happy place during the Cold War era, but once readers get past Letts’ troubling description of animal quarters at Madison Square Garden, “The Eighty Dollar Horse” takes you to a happier place.